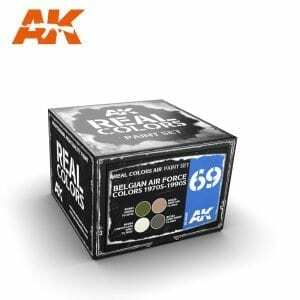 This set contains the four camouflage colors are indispensible for painting models of Belgian combat aircraft from the 1970s to the 1990s. 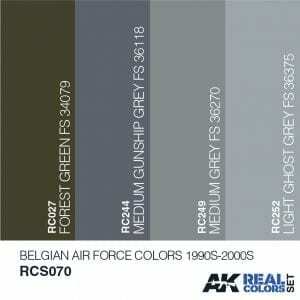 During that period the Belgian Air Force adopted a modified US SEA scheme, in which FS 34079 Forest Green was replaced with FS 34064 Dark Green. 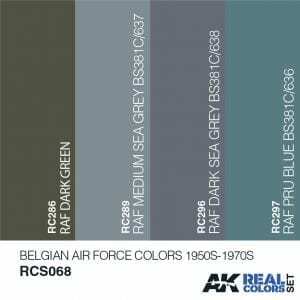 This camouflage scheme was applied to such aircraft as the Mirage 5BA, F-104G, TF-104G, F-84F, RF-84F, T-33A, Alpha Jet and C-130. Our Real Colors are the highest quality acrylic lacquer paints, made from a chemical formula that is improved over other brands in the market. 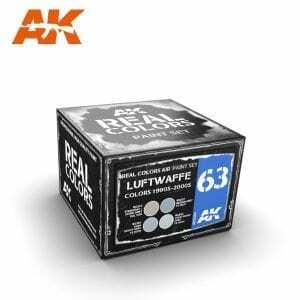 They spray through an airbrush in a silky smooth manner, and adhere to the surface and dry perfectly with a soft satin finish. These paints work superbly with all kind of weathering or masking products. 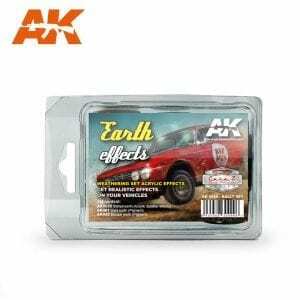 They may be diluted with AK-Interactive’s specific thinner, or thinners from other manufacturers that are intended for acrylic lacquer paints (non-vinyl). 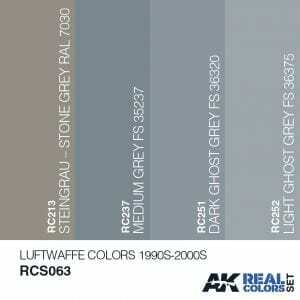 They may also be easily mixed with other acrylic lacquer paints. 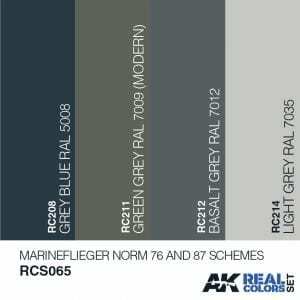 Real Colors accurately reproduce the original colors. 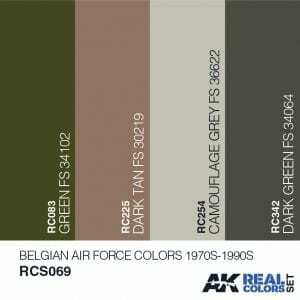 This set contains the four camouflage colors that had been most commonly used for painting Belgian combat aircraft from the 1990s, onwards. 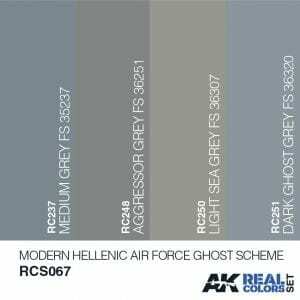 Included are the three grey tones used for painting the F-16 fleet and the Forest Green FS 34079 applied to the army helicopters (NH90 TTH, A-109BA). 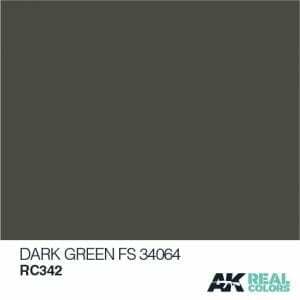 Our Real Colors are the highest quality acrylic lacquer paints, made from a chemical formula that is improved over other brands in the market. They spray through an airbrush in a silky smooth manner, and adhere to the surface and dry perfectly with a soft satin finish. These paints work superbly with all kind of weathering or masking products. 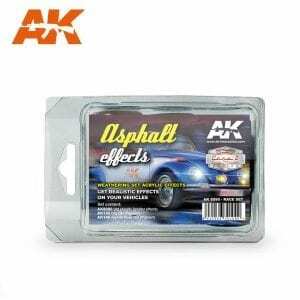 They may be diluted with AK-Interactive’s specific thinner, or thinners from other manufacturers that are intended for acrylic lacquer paints (non-vinyl). 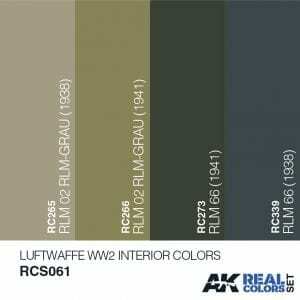 They may also be easily mixed with other acrylic lacquer paints. 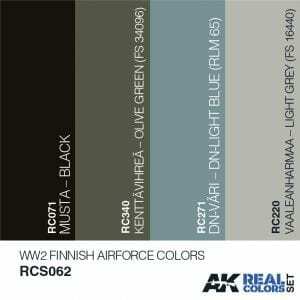 Real Colors accurately reproduce the original colors.